31 Days of Halloween '17 - Day 30 - "Stranger Things 2 (part two)"
Here we go. I'm continuing from where I left off and attempting to finish the second season of Stranger Things. It's been absolutely incredible so far and I'm really excited about where this is gonna go. The story between Nancy and Jonathan may be my favorite one going this season. I just find the entire thing to be so fascinating, especially with the addition of them going full on investigative journalist. They seem to have a lot better plans this season than their whole, Home Alone-style trap for the Demagorgan. Is Will ever going to not be suffering in this show? I feel like he easily has the toughest role among the young cast and it doesn't seem like he's ever going to get better. 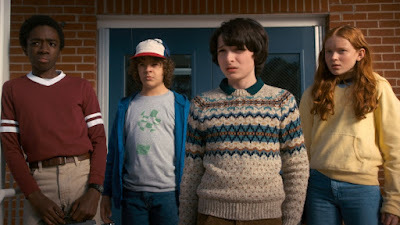 In fact, it seems like he's just going to have to live with traveling to the Upside Down for the rest of the show so it's likely to remain the toughest role for the young actors. I knew when they introduced us to the idea of "Him" spying on them through Will that it'd be used and boy was it. Really seems like that tunnel system is going to lead to an IT-like finale and I'm so down for that. I love the different influences that this show takes on. Oh yeah, I guess I should talk about other parts of the episode. I love this developing dynamic between Dustin and Steve. I can't say I was ever expecting to enjoy that pairing as much as I have. Though I'm pretty sure you could pair Dustin with just about anyone and it would work. He's just that kind of character. Woah a whole episode devoted to Eleven? I feel like this is something that fans have been wanting since the shows inception and it came across...weird. Don't get me wrong, I really loved the look of the episode of the themes it explored but the tone shift felt very jarring. We went from a Spielberg movie to something else entirely and it really stood out amongst the other episodes this season. Also, tomorrow's entry won't be in right away because I'll be actually seeing the film tomorrow afternoon, so a 6am entry would be pretty impossible.